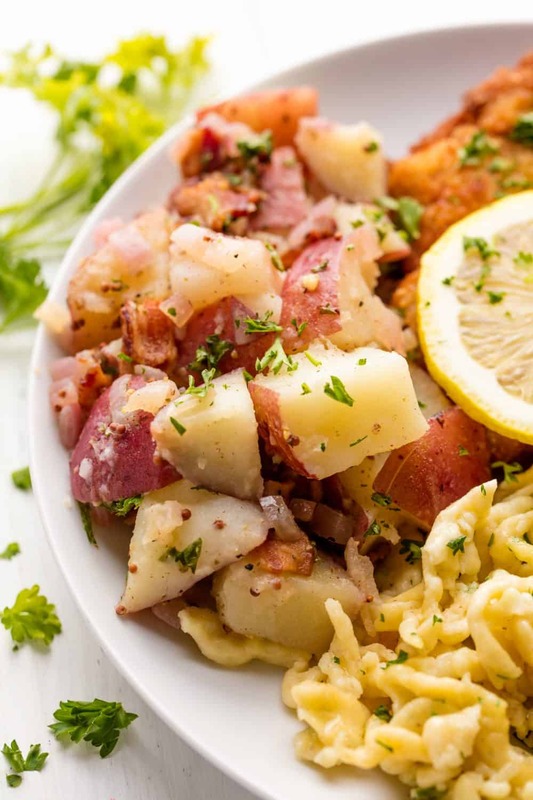 Old Fashioned German Potato Salad is dressed with a dijon vinegar dressing and can be served either hot or cold. German Potato Salad is a traditional potato side dish originating in Southern Germany. In Northern Germany, the dish is different and more similar to an American style potato salad with mayonnaise. Generally, German Potato Salad refers to this Southern style dish. What is the difference between German Potato Salad and American Potato Salad? 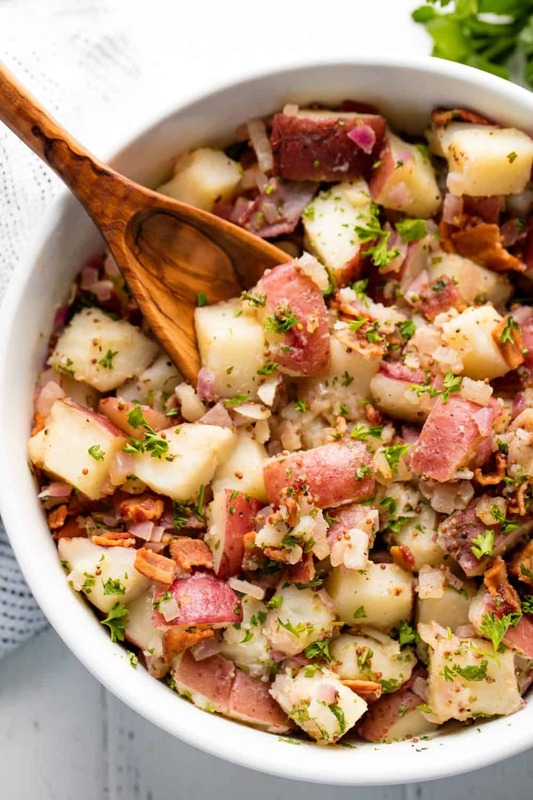 In a Southern German Potato Salad, the dressing is made from bacon drippings and vinegar. In an American Potato Salad, the dressing is largely mayonnaise based. 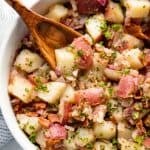 What is German Potato Salad called in German? Kartoffelsalat is the name of German Potato Salad in the German language. Is German Potato Salad served warm or cold? Either! German Potato Salad can be served either warm or cold. It’s a matter of personal preference, and it is delicious either way. Storage of Leftovers: When chilling, you can simply cover the bowl in plastic wrap and place it in the fridge. For longer term storage, this salad should be stored in an airtight container in the refrigerator. Since it can be enjoyed cold, no reheating is required. Bring a large pot of water to a boil. Add in diced potatoes and boil until tender, about 10 to 12 minutes. Drain potatoes and place in a large mixing bowl. Meanwhile, add bacon to a cold large skillet. Heat over medium heat and cook bacon until crisp, about 8 to 10 minutes. Remove bacon from grease and set aside, leaving grease in pan. Add red onion to grease and cook 5 minutes until onions are soft. Whisk in vinegar, olive oil, sugar, mustard, salt, and pepper until heated through, 1 to 2 minutes. Pour sauce over cooked potatoes. Toss with bacon and parsley. Serve hot, or chill to serve cold. Very easy and very tasty. Jus like I remember as a young lad in Germany! Turned out just as I remembered it, delicious!